Tested by me, this fixed worked with wired connection mode with DUALSHOCK 4. People who want to follow my instruction need to intall lastest HID Guardian. 2. 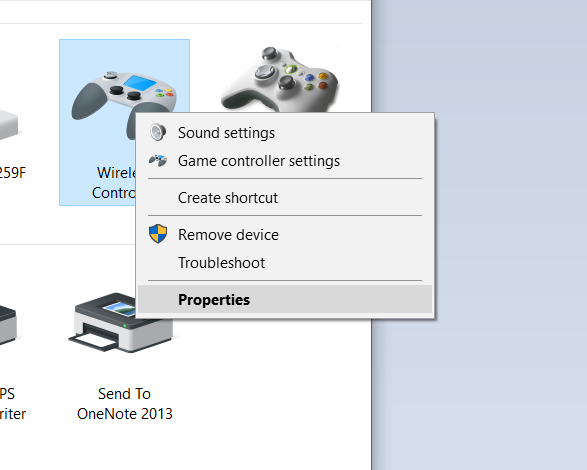 Right Click on "Wireless Controller", choose "Properties"
3. 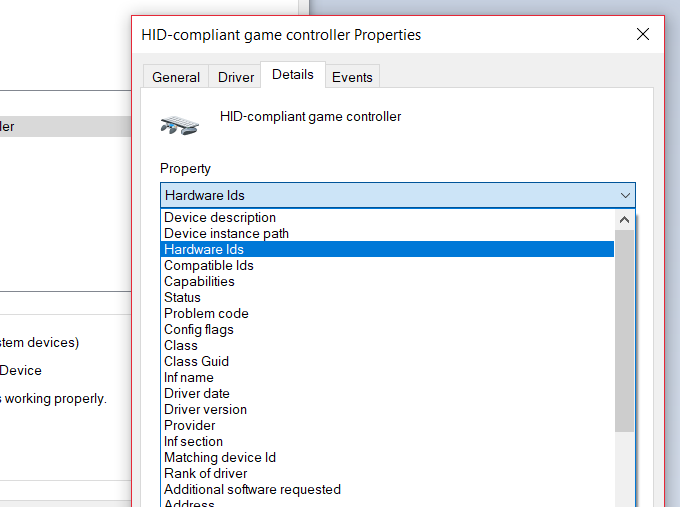 Go to tab "Hardware", Select "HID-compliant game controller", then click "Properties"
4. 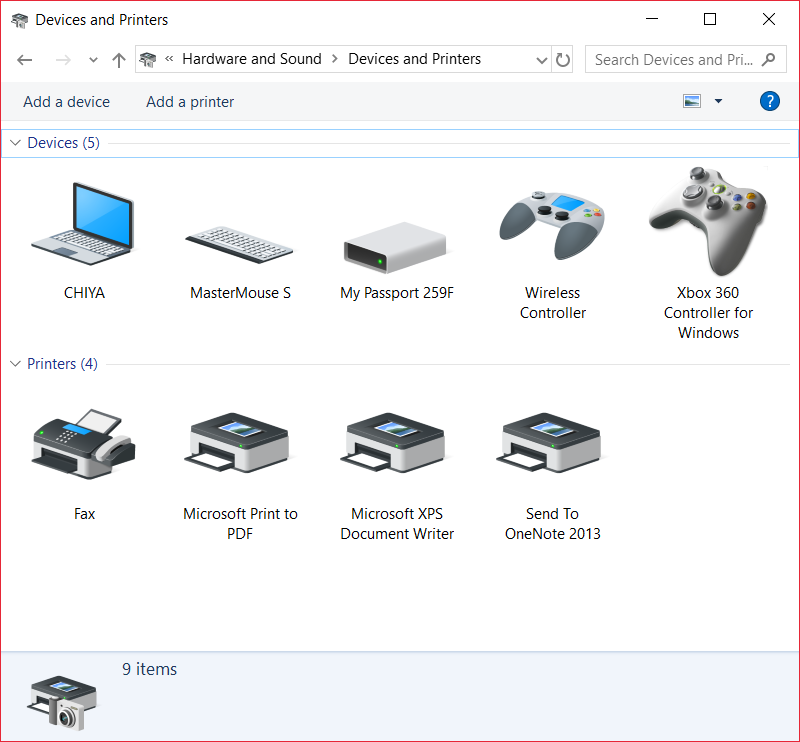 Go to tab "Detail", select "Hardware Ids" from the drop-down menu. 5. Copy first 3 strings to notepad, it will be need later. 8. Right Click on "AffectedDevices", choose "Modify..."
9. Paste the 3 strings we copied from Hardware Ids in step 5, one per line. If some of them are already in there, skip. Make sure the last line is blank. Press OK.
10. Restart your PC. Now, Exclusive Mode should be work again for DUALSHOCK 4 with wired connection mode. 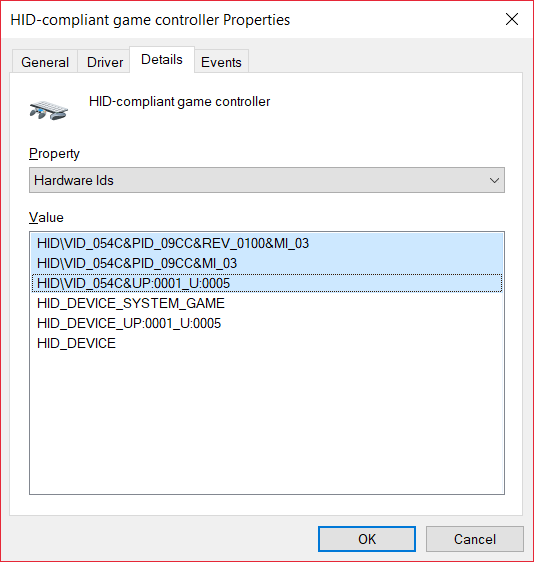 The reason is problaly Windows 10 Fall Creators have a new driver that change DUALSHOCK 4 Hardware Ids in USB mode. 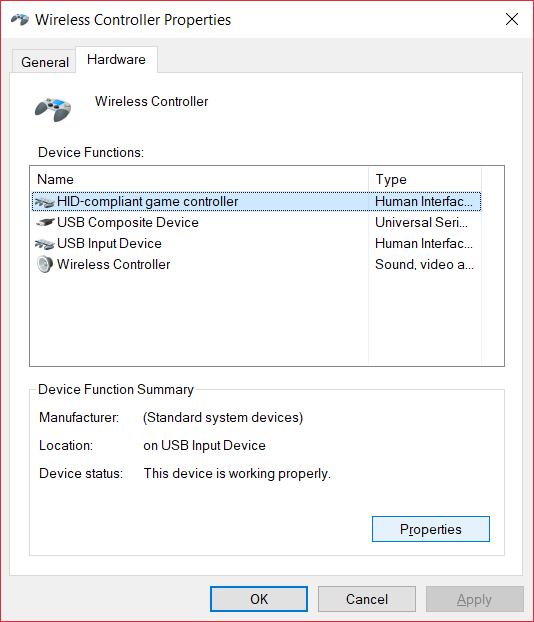 Since I use Official DUALSHOCK 4 Bluetooth Dongle from Sony, I can't confirm this on Wireless mode with other Bluetooth dongle. Last Edit: 1 year 4 months ago by Nechigawara. 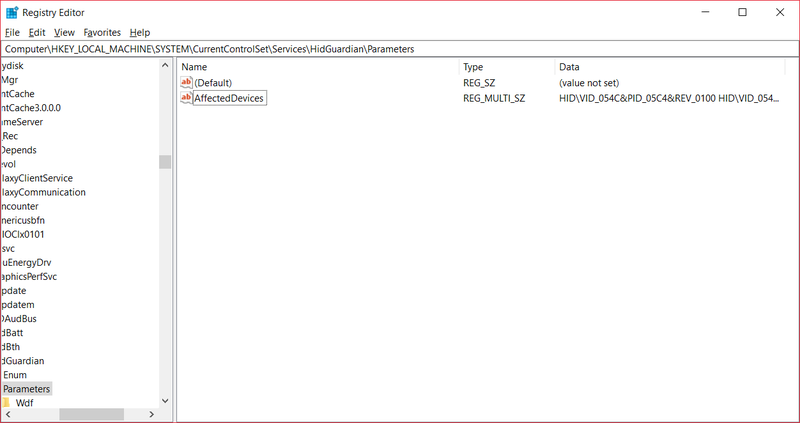 I just started messing with Inputmapper on my machine with latest Fall Creators and the 3 Hardware ID's I had from my Sony dongle were already there, and the same listed for an old Logitech 2.0 EDR. But wired had 2 different entries. Bluetooth: Works but following this guide alone doesn't. 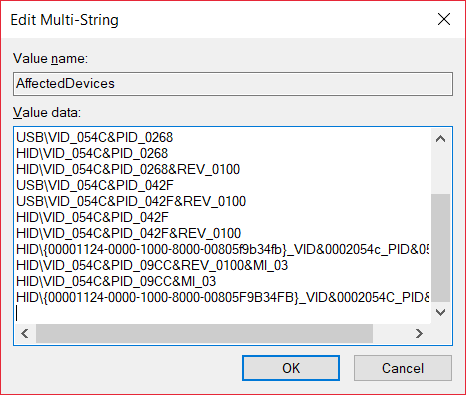 Hardware IDs spitted out following this guide for Bluetooth..
i had to modify it before copy/pasting the strings into the regedit.. to this..
Basically the "BTHENUM" prefix needs to be replaced with "HID"..
Last Edit: 1 year 4 months ago by clix. 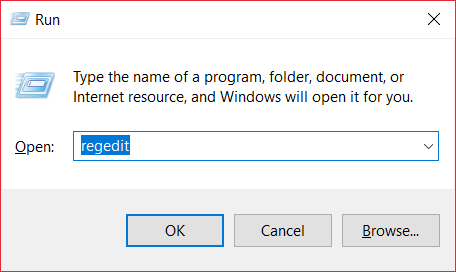 Ok, so my regedit doesnt have an "affected devices" tab to modify. Do i just create one or should i modify "default" ? Have you intall lastest HID Guardian yet? Thanks for the guide! Fixed the issues I've been having. Step 6 should say WinKey + R, not Ctrl. In step 10 you only need to restart the InputMapper Cerberus Whitelister service. dehrk wrote: Thanks for the guide! Fixed the issues I've been having. For the service part, for some noobs, i think keeping whole pc restart is better so the noobs won't break their PC by stop some important services by accident. You can stop and restart the service from the HIDguardian directory using the supplied shortcuts. I had exclusive mode working with Bluetooth (with the above fixes) before this last windows version, but I don't need it so not going to try and figure out what got broke. Last Edit: 1 year 4 months ago by wirenut48. I didn't have the shortcut you're mention except the install & uninstall one. And the bat file in are doing nothing. Well, I still think restart the pc is more easier solution.